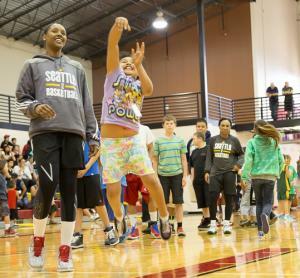 SEATTLE – The Seattle Storm, in partnership with the City of SeaTac and Seattle Southside Visitor Services, will be hosting a second community practice, open to the public, from 6:00 to 8:00 p.m. on July 1 at Tyee High School in SeaTac. The event will boast popular events such as a meet-­‐and-­‐greet with players, games and contests that offer prizes, and the opportunity to participate in Storm drills as directed by head coach and general manager Brian Agler. Last month the Storm players were well received at Nisqually as dozens of kids joined layup lines and free-­‐ throw contests and both children and adults were able to meet their favorite players at the end of practice, and this month, after a long road streak, the players and coaches are again looking forward to interacting with its fans both young and old. The 2010 WNBA champion Seattle Storm is one of six independently owned teams in the WNBA, the world’s most successful women’s professional team sports league. Established in 2000, the Storm is committed to bringing outstanding professional basketball to a fan base rich with tradition and support. The Storm leads the way for change in the community with outreach programs for youth basketball, health and fitness. The organization looks to be an inspiration for girls and women while providing support and motivation to better the Puget Sound. For more information or to purchase tickets, visit StormBasketball.com.